It’s not always and only about how large a house is, whether it offers floor plans inviting visitors to enjoy sea breezes, mountain mornings, or the pastoral peace of the countryside, views do matter. 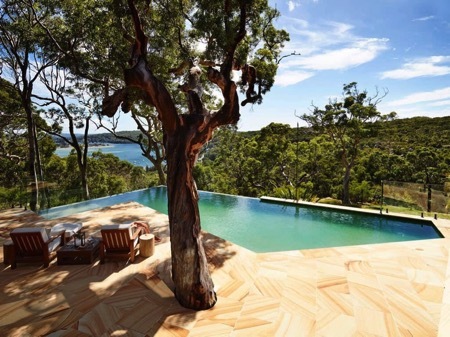 Jane Pople finds some houses with the most spectacular panoramic views. This stunning collection of properties, most situated on challenging terrains, offer great views and all are true pieces of architectural genius. A top the 70-metre high cliffs of Dover Heights, Australia, rising steep over the ocean, stands the futuristic structure of the House Holman private residence with a crisp white silhouette cutting in the vast background of the deep blue sky. The house has been developed by Durbach Block Jaggers Architects who have designed its plan inspired by Picasso’s surreal painting The Bather. Indeed, the structure of the building develops in a complex series of meandering spaces that arc, fold and stretch in response to landscape and views. The rough stone walls of the lower levels cut into the cliff, forming a solid base, and continue along the cliff edge to form eccentric terraced gardens and a vase-shaped rock pool. Pretty Beach House is a sophisticated, private guesthouse offering top quality services, modern amenities and luxurious ambiance, a private chef for exclusive gastronomic experience, breathtaking panoramic views, exciting private boat trips and a Zen-relax spa. The best part is that the house is designed, built and purposed to make guests feel at home in an intimate, safe and authentic environment, nestled in the serene and quintessentially Australian bushland. The property features a guest-shared main house and four exclusive private pavilions, all developed and furnished in a sophisticated style of charming elegance and luxury. 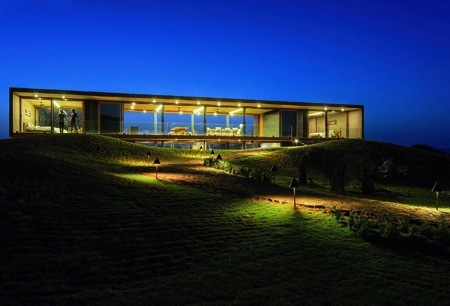 In an attempt to bring humans and their residences into a more intimate unity with nature, the team of Ajay Sonar has developed the Panorama House and placed it atop a small hill against the background of the Gangapur Dam in Nasik, India. As in an idyllic dream, the Sahyadri Mountain frames the beautiful scenery and incorporates the building within. With panoramic glass walls framed by a simple pigmented concrete cuboid shell structure, the house stands almost invisibly amidst the landscape, matching the colour of the surrounding soil and mountains, and allows residents to enjoy the magnificent performance of weathers and seasons in a picture perfect view. 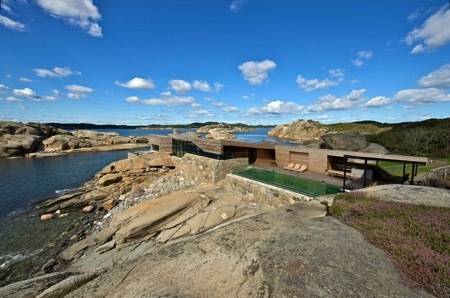 The Summer House, designed by JVA, stands among the rugged rock formations and huge boulders lining the coast of Vestfold in the southern part of Norway. It is a low elongated structure, looking itself like a ‘living’ rock for being perfectly adjusted to the surrounding terrain in terms of shape, scale, material and colour. The overall shell of the building is divided through cuts-in to allow for wind shielded outdoor areas protected by the house itself. The house offers an infinity pool and a large terrace overlooking the spectacular North Sea, protected from harsh sea winds by a glass wall, which allows unobstructed panoramic views. Walking along the edge of the steep, rocky shores of Tinos Island and enjoying breathtaking views to the Aegean Sea, there is a sight that will stop the wanderer and make him consider whether what he sees is a mirage or reality. A large piece of a water mirror extends to the horizon, vanishing and merging with the seascape, creating a stunning mirage vision. Yet it is very much real: an architectural masterpiece created by Kois Associated Architects and integrated into the landscape as if it was part of it. 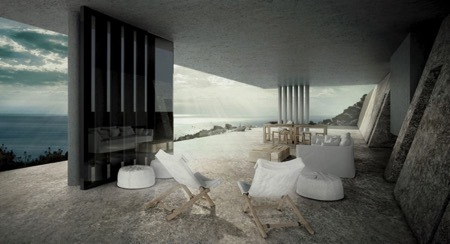 The rimless pool itself is a roof covering the large open space living area, while the rest of the premises are built into the rock itself, ‘disappearing’ into the scenery. Local building techniques and materials have been used to ensure proper temperature regulation and protection from weather and solar radiation. Located atop Los Angeles’ luxurious ‘Bird Streets’ neighbourhood, the Hopen Place Residence is known as one of the most prestigious properties on the Hollywood Hills and home of the actor Matthew Perry, star of ‘Friends’. The amazing three bedroom, four bathroom, 4,000 sq. ft. residence is a sleek architectural artwork, developed for a lavish Hollywood lifestyle, and boasts top-of-the-line amenities, deluxe interior design and unparalleled comfort. 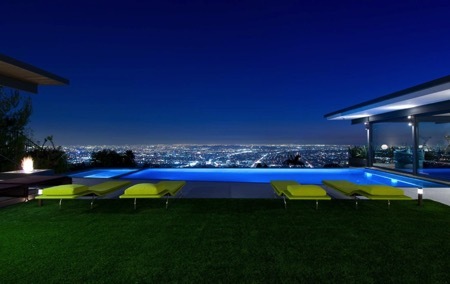 A custom made sliding glass wall opens the living area and leads into a sensational central courtyard featuring a solar and gas heated spa, revealing stunning jet-liner city views to downtown LA and the Pacific Ocean over the blue cascading waters of a dazzling ‘wet edge’ infinity pool. 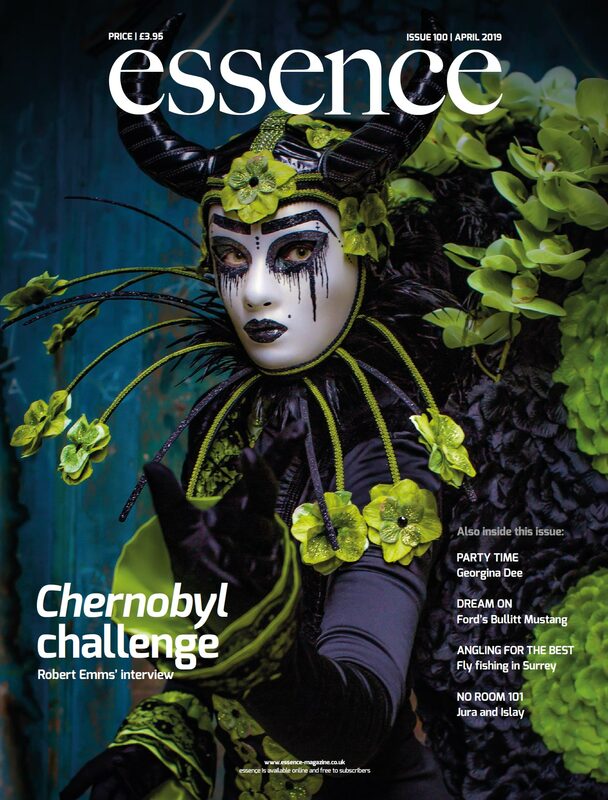 This article is contributed by Adorable Home Magazine and first appeared in The Lux Pad, www.amara.com/luxpad.